Think beyond the flowers this Mother’s Day and get your favorite lady a gift she’ll enjoy year-round. If your mother is a Disney fan (and who isn’t? 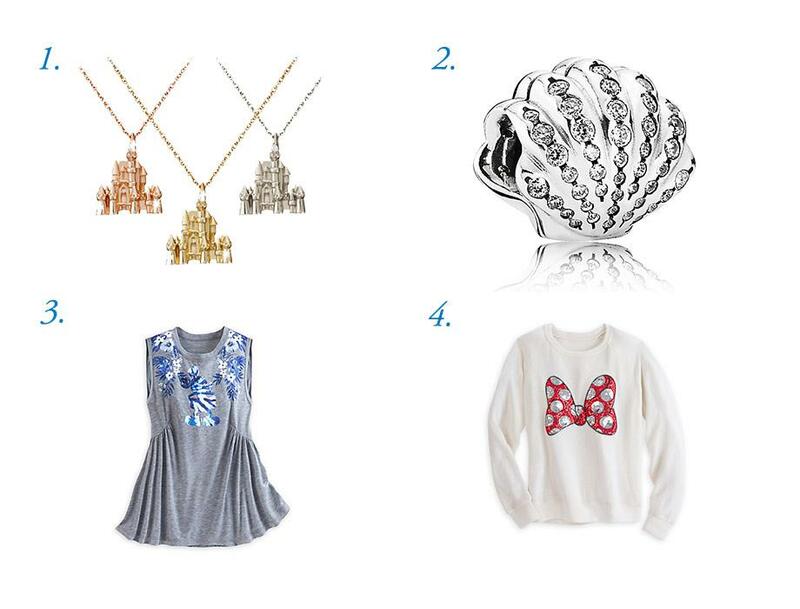 ), this handy gift guide will help you find the perfect Mother’s Day Disney gift she’s sure to love. If your mom is always on her style game, these gifts are sure to make her feel as good as she looks! 1. 18 Karat Gold Disney Castle Necklace – Mom’s home is her castle… but so is her new favorite piece of jewelry, made from stunning gold with a diamond included for that Disney sparkle. 3. Mickey Mouse Tropical Top for Women – This sleeveless top makes anywhere mom roams into a tropical paradise fit for an island queen. 4. Minnie Mouse Sequin Bow Sweater – Who says sweaters can’t be fabulous? The only thing that will shine more than Minnie’s classic bow is mom’s smile when she sees it. 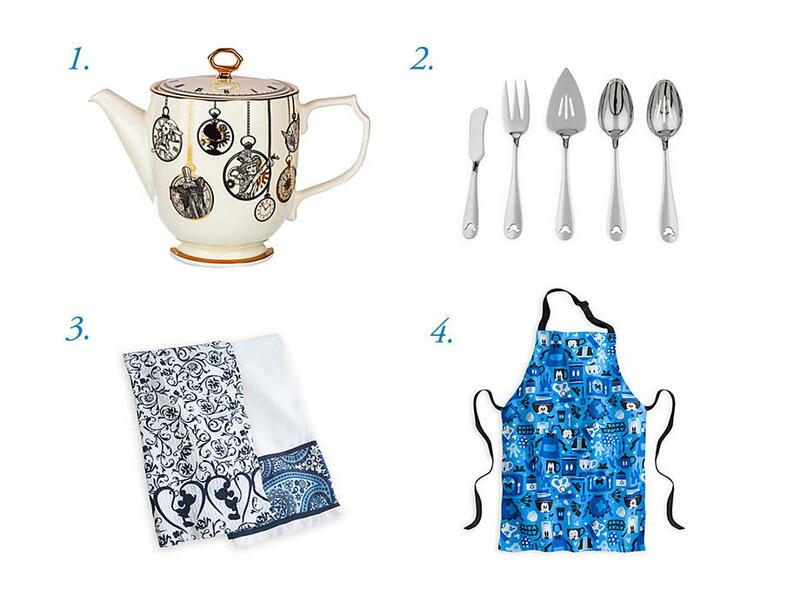 These gifts are perfect for moms who make “Be Our Guest” a personal motto! 2. Mickey Mouse Icon Serving Set – As if mom’s kitchen wasn’t magical enough, here’s a serving set that really brings people — and a Mouse — together. 3. Mickey Mouse Icon Indigo Kitchen Towel Set – This elegant towel set makes clean-up the best part of the dinner! 4. Mickey Mouse and Friends Apron for Adults – “Kiss the Cook” is so last year. Covered in fun designs inspired by beloved Disney characters this apron is equal parts practical and pretty. 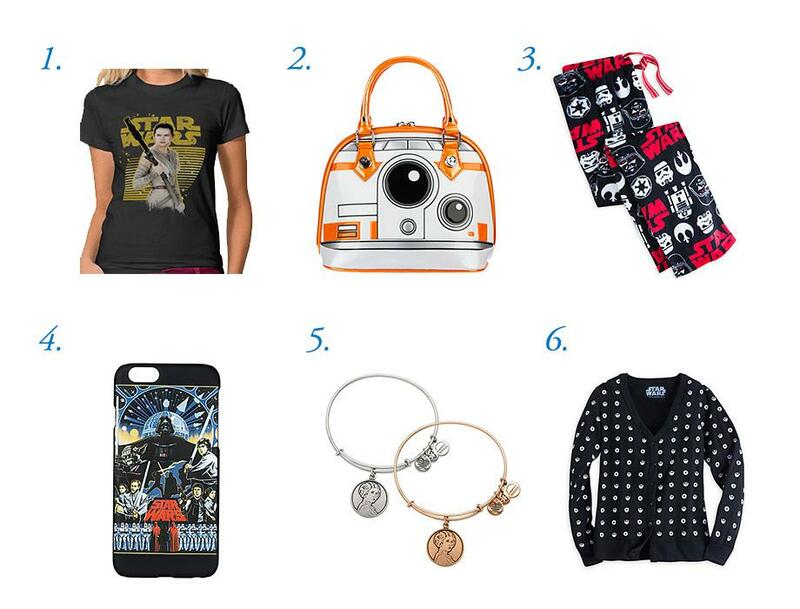 You won’t have to go to a galaxy far, far away to find the perfect gift for your Star Wars-loving mom. 1. Star Wars Personalized Tee Shirt – The Force is strong with Leia and Rey… and the tees that features them, which you can customize in Mom’s favorite color, graphic, and style. 2. Star Wars BB-8 Bag by Loungefly – A perfect accessory for the droid-obsessed mom who keeps on rolling. 3.Star Wars Fleece Lounge Pants for Women – Soft and comfy so Mom can kick back and relax after a long day of saving the galaxy. 4. Star Wars iPhone 6 Case – Your mom can protect her phone with a Star Wars-inspired case that gives “The Force is calling to you” a whole new meaning. 5. Princess Leia Bangle by Alex and Ani – The rebel royalty of the Star Wars universe has heart and guts in equal measure… in other words, she reminds you of your mom. 6. Star Wars Cardigan for Women by Her Universe – Mom will be a force to be reckoned with in this Star Wars cardigan featuring an Imperial Crest and Alliance Starbird pattern. When she’s finally done “whistling while she works,” mom can unwind with these thoughtful, cozy gifts. 1. Mickey and Minnie Mouse ”Tsum Tsum” Plush Slippers for Adults – Easing into a pair of slippers is the best part of any day, including Mother’s Day, and these comfy Tsum Tsum slippers will make it the cutest part of the day, too. 2. Eeyore Lounge Pants for Women – Everyone’s a little bit of an Eeyore when they’re sleepy, but these lounge pants will brighten any mom’s mood. 4. Disney Cruise Line Robe for Adults – This plush robe turns every night into a vacation as relaxing as a trip to sea. 5. 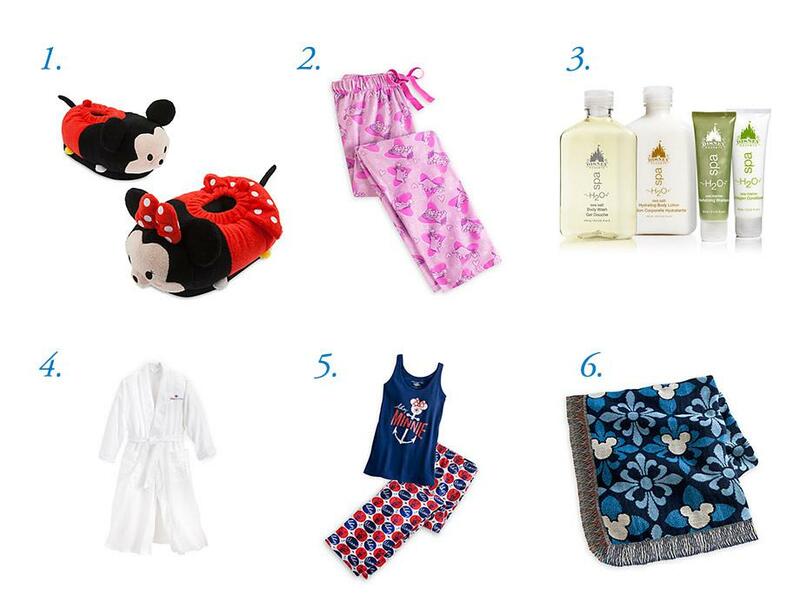 Minnie Mouse Sleep Set for Women – Disney Cruise Line – Mom can set sail for a peaceful night’s sleep in this pajama set inspired by the high seas. 6. Mickey Mouse Icon Indigo Throw – There’s no better way to cuddle up on a chilly night than with a Disney icon. If your mom is always hunting for the perfect Disney décor, here’s a whole Magic Kingdom of suggestions to add that finishing touch. 1. The Haunted Mansion Bookends – You’ve heard of “ghost writers” this is our version of a “ghost reader.” Perfect for the mom who could spend an eternity with a good book. 2. Alice in Wonderland Garden Lantern Light String – This whimsical light set will turn any outdoor gathering into a mad tea party in spirit. 3. Alice in Wonderland Flower Pot – Medium – Mom’s flowers will bloom so brightly in this colorful flower pot, you’ll swear they were imported straight from Neverland. 4. Fantasia Ear Hat Ornament Set –It’s never too early to start the Christmas countdown, especially with the perfect ornaments for fans of the Disney Parks who look forward to tree-trimming all year long. 5. Mickey Mouse Embossed Photo Frame- 5” x 7” – Add Mickey to your mom’s favorite vacation memories for a picture-perfect gift. Now that you’ve got the inspiration to bring some Disney flourish to your Mother’s Day shopping, remember to use your Disney Visa Card when purchasing. 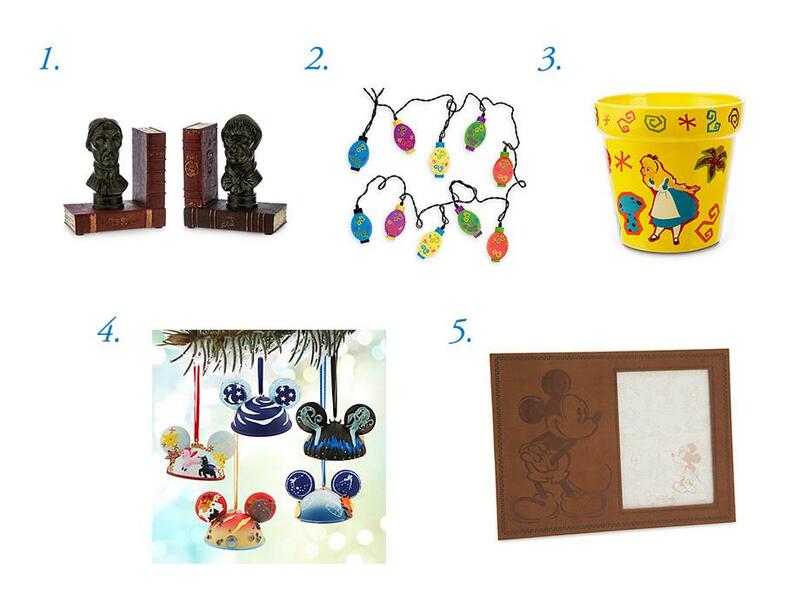 Cardmembers save 10% on select merchandise purchases of $50 or more at the Disney Store and DisneyStore.com,1 or, use Disney Dream Reward Dollars® you might have earned toward any of these gifts.2 Your mama would be proud of your savings expertise.